It’s not that I don’t like to cook, it’s just that I’ve never really learned how to cook. It just doesn’t come naturally to me and I haven’t taken the time to practice it much. And when I’m cooking for myself I’m content making cereal, peanut butter on toast or Top Ramen for breakfast, lunch and dinner. Anything else just takes too long. Unfortunately, since I don’t make the food, I have to clean up the food when I’m at my parents’, which means I’ve been on clearing-the-table and storing-the-leftovers detail for literally decades. SO MUCH DELICIOUS EARTH SUSTENANCES! I must investigate this matter! the “earth sustenances” were quite good, Rinthia; i’m still full from that brunch – two days later! so much for the Powers of Scrawn. ugh. Now I know why uncle spends so much time down here! Oh dont you try to lecture me on vodka. I drank from the “just to get drunk” grades up to real Russian quality stuff and I still dont like the taste. I prefer sweet alcohol like Tatratea and Jagermeister. i think that’s a good tip for any gift-giving occasion, Eddie: just add vodka. makes every gift better! and: Rinthia only took first by 3 minutes! so close! 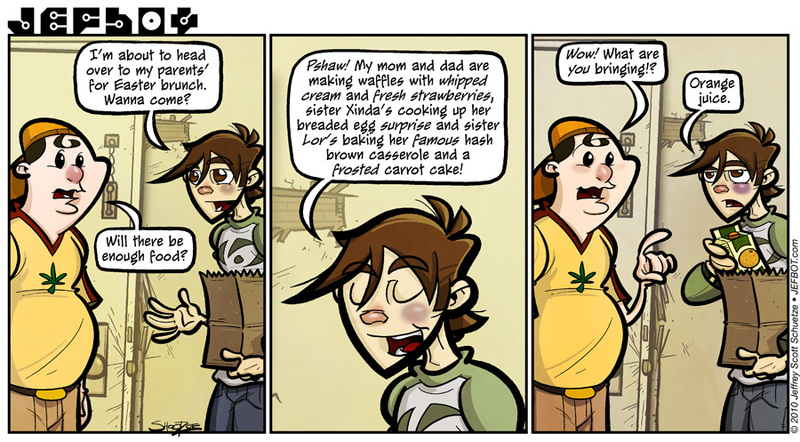 this comic reminds me of… well, me goin’ to a potluck and bringing a bag of Oreos. mmMMMmmm… Oreos. i think i’d rather have Oreos than OJ, Cogwell! That poor door got pretty mangled, now that we can really see what it looks like when it’s closed. The fam is sure to have some questions for JB with his shiner and all. I went to bed early last night, and didn’t get around to writing an email, but: HAPPY BIRTHDAY, JEFF! *Super mega birthday hugs* 😀 I hope it’s amazing, and full of love and laughter! i do love me some orange juice at breakfast, Spanky (and happy hour, for that matter!) it’s usually just so dang expensive at restaurants and they serve it to you it in tiny glasses. You DO realize how hard it makes for the rest of us to know when it is appropriate to congratulate you, right? There that should solve that problem. No. You are going overboard. But, Jefbot, cooking is fun! i know, Shan! i’ve only cooked a real meal like, twice in my life but i had a great time doing it. i really gotta make time to start cooking more often, methinks. Food is food. And if it’s good food, even better. I can’t (or most certainly WONT) cook for the life of me >___< Kitchen and me are natural enemies. But I can install ligh fixtures and ceiling fans! Still plotting how to get over-friendly baby sister fixed to the roof though. i do love eating good food more than i do preparing good food, Sonitan! funny that you and kitchens are natural enemies, though. did you have a kitchen mishap as a kid where you were scalded or burned? Im afraid to ask what is Xindas surprise. Anyway, how can you leave when your doors are in THAT state of direpair? Im glad Jefbot still has a reminder of Cel under his eye. Speaking of whom, have you seen that *Yesman! * movie yet? If so did you noticed that girl and what do you think? And yeah, Eddie in my face. I overslept and just woke up. Yeah, I know, three o clock in the evening… Ill definitely have to get at least one *FIRST! * this month. Thats a serious oversleeping dude. I dont want to be charged with attempted murder if they went drinking with us Eddie. Well, yeah, I havet thought about it this way, hell you are right. heh. actually, her “surprise” was all good, Maryz! it was some sort of egg casserole with spam! YUM. and yeah, seems jefbot is just choosing to ignore the state of that door. still haven’t seen the “Yesman!” flick. will try and do that tonight and get back to ya. Yep, its allmost half past midnight when Im writing this, so you should get an idea just how nocturnal I can become from time to time. Just a slight oddity of mine, I assure you. hmmm… if i had to choose between general cooking or baking skills, that would be a hard choice indeed, shanna. i’m leaning toward baking ‘cuz i have a major sweet tooth, too. Happy BirthdayJeff!!!!! And many more dahhhhhhhlink. OMG I read this comic and my tummy YELLED at me. I should prolly put something in it. Yes happy anniversary of your birth, Jeff! Great comic — truly reflecting your bachelor skills! Ha! Thats funny cause I learned to cook for real at college, B.A. in Broadcasting. I do most of the cooking at home, but its nice when my wife does some. Its a lot of fun. Ha! That’s funny! Hey, orange juice is key to a great mimosa! … someone is bringing the champagne right?!? P. S. HAPPY BIRTHDAY JEFF!!! Hope you have a wonderful day! yep! sister Lor brought the champagne, Funnyshaffer. the day was wonderful, thanks! First off, Happy Birthday buddy. Glad to see you are good enough to make us all happy on your birthday by putting a JB up. Now down to business. I TOTALLY relate to JB here lol. I am usually the one that brings the soda to the office banquets!! Putting me with cooking is a BAD idea lol. As always, another great strip. Now I am just sad because Cel is gone but JB still has that dang shiner to remind him of her! thanks for the “birthday” greetings, man! and glad you could relate to the strip! yeah, whenever i’m invited to a (non-family) potluck i usually bring pizza or chicken wings. maybe a vegetable platter from costco. that’s about as fancy as i get. Great strip. I can cook but some of my relatives can’t so I know what it’s like. Those who can’t cook clean up eh? and yep, i think “Those who can’t cook, clean up” is just the natural order of things. i’ve learned to accept this. Ah! Meemosahs? That’s how I celebrated! It wouldn’t be a jefbot Easter without them. Happy Birthday, jefbot!!! And he really only brought OJ! ain’t nothin’ wrong with oj!!! as long as the omelet’s tasty, has fewer than 3 ingredients and takes under 5 minutes to cook, i’m all for it, Animie fan! … are you counting the eggs used to make the omlet as an ingredient, or three ingredients to go in it? if your counting the eggs it’d only have cheese and bacon… you can’t fry bacon can you? oi, i hope i get paid for this. but you not dying of starvation and continuing the comic’ll work. Anyway, this is a spectacular one-off, bot. You are the web-comic MASTER! Great, now the orange juice is going to rot in your fridge! zomg lmao. I’m hungry and now I want OJ and I haven’t had any in over two years… Jeffbot=cheap yeah? And lulz to michaels comment. Oh wow this whole thing has really made my day a thousand times better, thanks a ton to the both of you. glad MC’s comment tickled you, but he lies. LIES I TELL YOU! and yeah, jefbot’s eye isn’t fully healed just yet. maybe he’ll be 100% by next strip…? thanks for the “happy b’day”! can’t wait to see what happens with cel and musashi. keep up the great work! aah, da door’s still nt fixed proper. heh. bt hw is he gna explain da bruises 2 hs mom?? and i bet sum1 already did dis b4 bt i hv 2 ask, is dat a marijuana leaf on da cf’s shirt? and the Cornfather’s symbol is whatever you want it to be. i call it his “magical leaf” but if you want it to be a pot leaf, that’s fine too. any jf fan know where i can get cheap used macbook? been looking for one. sorry jb. thanksgiving in my head. lolz. those foods u mentioned sounds delicious. have any of u tried chicken cooked in bamboo. or fried pork leg. or fried cicada? they are delicious. hmm how about monitor lizard cooked in soysauce and ginger. heavenly food. the infamous matal aka sago tree critters? thats food for the gods. i don’t believe i’ve had chicken in bamboo, jf300, but i have had fried pork leg and found it delicious. FRIED CICADA!!? i’m grossed out but also intrigued. what’s it taste like? i’ll try pretty much anything fried. heh. and you’re just trying to tease me about the monitor lizard, right? that’d be like eating DRAGON! rad. and i don’t even want to know about the “tree critters” for fear that i might be missing out on something insanely awesome. as for where you can get a cheap macbook, do you have craigslist over there? any cheapness you’d find over here would be negated by the shipping charges. Cooking is fun. What’s not fun is eating your mistakes. *bleh* But waste not, want not. heh. seems whenever i try to go off the beaten path (cereal, scrambled eggs, toast, etc.) i make something not fun, Foxmouse. Oh ho~! Book tour sounds supa fun, I’ll look forward to that! I’d be happy to cook ya something nice if I had the chance and the supplies were willing; sometimes we don’t always have the yummies for a big meal. My friend Amy loves to bring me fixings just so I could cook it up for her. Your feeds are broken (at least in firefox) by a blank line at the beginning of the xml (the first characters must be <?xml, no n before it). BTW, awesome comic, been lurking for months. crap! it’s coming through fine on my Mac but i’ve gotten a couple other people saying the same thing about the broken feed in Firefox, Anon. i know nothing about RSS but it looks like my code hasn’t been altered. maybe if i republish in WordPress it’ll fix it? i’ll give that a try. thanks for letting me know. Your mom gave me some strawberries & a Jeffbot shirt!! (; I’m officially happy. the closest i get to making dessert is when i bake those ready-made cookie dough things, xero. i make ’em GOOD, too – i turn on that oven and place/remove those cookies like NOBODY’s business! I dont think I want to know what the surprise is in Xindas “egg surprise”.